Toppings with Extra cheese? Doesn’t it bring water to your mouth? India is synonymous to delicious food and the best outlets to crave one’s hunger. Be it kids aur elders, Indians just can’t resist tasty food, and who could resist the cheesy Italian bites of a hot fresh Pizza. It wouldn’t be wrong to say that no other International dish has managed to make such a significant mark in the landscape of our country as much as this Italian classic. It’s an absolute favourite and perfect for any special occasion or a small gathering. Here is a list of some of the best destinations where you can get your favourite pizza. Number 1 Pizza brand, Pizza Hut has always been a favourite spot for all the Italian lovers. Known for its splendid quality, it is a subsidiary of Yum! Brands, Inc., the world’s largest restaurant company. It is an American restaurant chain and international franchise that offers different styles of pizza along with side dishes. Pizza hut offers amazing discounts to its customers which they can avail using the Pizza hut coupons. It Pizza Hut is present in over 40 cities in India, offering delicious Pizzas, also with home delivery in selective cities. Next time you go for a party or movie with friends or family, Don’t forget to have pizza at your favourite outlet. The name says it all, because what we love about these pizzas is the crust or the base. You can choose between original crust or super thin, and they are both rustic and done well. The pizzas are available in four sizes – 6, 9, 11 and 15 inches. There are numerous toppings available among which our favourite toppings include Peri Peri Veg, Mutton Keema Khansaa, Moroccan Lamb and Szechuan Prawns. There’s plenty to explore as they offer a wide range – from classic Italian, Moroccan, Chinese, and Indian at a very affordable price range. Known for its great tasting Pizzas and sides, superior quality, exceptional customer service and value for money offerings, Domino’s is one of the favourite food spot for all pizza lovers. Be it any special occasion, a mini birthday party, a movie treat, a small gathering, a short meeting, Domino’s has always been the first choice of the mass. Dominos has endeavoured to establish a reputation for being a home delivery specialist capable of delivering pizzas within 30 minutes or else FREE to a community of loyal consumers from all our stores around the country. With huge range of varieties and amazing discount offers, it becomes very difficult to resist yourself from tasting this yum. Never miss a pizza treat, especially at Domino’s. You can easily find its outlet anywhere in Delhi. 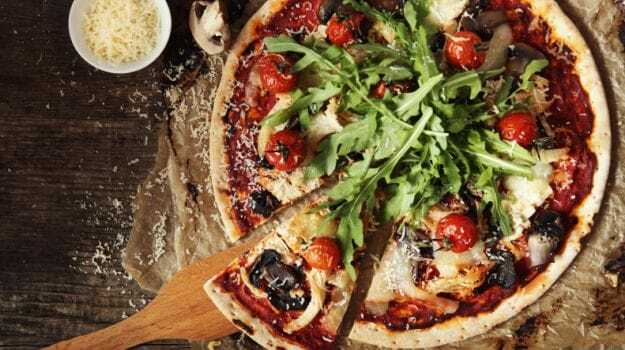 This new hotshot pizzeria is the talk of the town not just because of the celebrity chef brand tag, but for dishing out some really great pizzas. Their USP is the pizza crust – made fresh everyday, has a super thin crust centre with slightly chewy edges. Jamie’s boost of using the best local produce and have some interesting toppings with roasted wild mushrooms, White Rocket which comes loaded with three cheeses, and a spicy option called Chicken Alla Diavola. Their selection of pizzas is limited, but there are also appetisers and sides to choose from. This amazing pizzeria with its chain of outlets makes an earnest attempt to provide Big Apple inspired pizzas to the folks in Delhi and Gurgaon. While you wait for your order, you can also watch it being made fresh behind the counter. The best part is that you can also buy pizzas by the slice and try as many options as possible. There are multiple outlets in Delhi NCR with huge range of amazing mouth-watering Italian dish. You can visit any one of them and gift yourself and your loved ones amazing pizza treat. Dil Ka Corner, as tagline so the quality. Pizza corner has the core idea to provide wholesome food Along with conventional pizzas there are Indian variations with an array of choices including hand tossed crust, Italian pizzas, among others as well as appetizers, beverages, pastas, salads, and desserts. Go and visit the nearby Pizza corner outlet with your friends or family for a short outing and ger lost in the world of yum. Want a dose of New York-style, thin crust pizza? This is the place where your search ends. Go and head to this all amazing place for a scrumptious and mouth-watering treat with loved ones. The wood fired pizzas come loaded with interesting toppings and you can customize it as well. They boost of making fresh hand-tossed pizzas bases, and you can choose from whole wheat, spinach, beetroot and garlic. The all amazing cheesy pizzas will surely bring water to your mouths and are enough to satisfy your cravings for good food. Visit the outlet at Saket and Gurgaon and avail huge discounts on your order and gift yourself a pizza treat. A pizzeria that’s open till 4 AM, need we say anything more? That’s right. This late night pizza delivery set-up calls itself the pizza lab, and lets you create your own pizzas. You can choose your choice of crust, sauce, cheese and toppings. The sizes available are 9.5, 13.5 and 17.5 inches and you can also order by slice. They also have an extensive and interesting range of gourmet pizzas on offer, if you are not that into customization. Our favourites include Something Fishy, Hot Spot and Honey! It’s Bacon. One of the favourite place for Delhi University, North Campus students’ is Hudson Lane, where you can find amazing restaurants and bars in a single lane. Big Yellow Door is one such place which is one of the favourite place for the scholars to hang out in. The Butter Chicken Pizza with tasty toppings and crust full of cheese here is irresistible which will definitely leave you mesmerising and the vintage decor will make you swoon. It has minimalistic interiors that looks every bit like clandestine. If you are a Delhi University student, then how can you miss such an amazing and delicious delight. Call your friends, make a plan and go and visit this place and enjoy the all new yummy pizza. If your idea of enjoying pizzas is not just giving into gluttony but enjoying the experience with fine wine, then this award winning restaurant at Hyatt Regency is sure to impress you. The traditional wood-fired Italian pizzas are simple, rustic and flavours at their best. Our favourite here is the pizza with the same name as the restaurant, which comes topped with roasted garlic, goat’s cheese, pesto sauce and sun-dried tomatoes. Visit this outlet at Ring Road, Bhikaji Kama Place and enjoy the all yummy and delicious stuff with your beloved ones. So, This was a compiled list of 10 most amazing places where you can go and get your favourite, delicious and all yummy pizza and enjoy a treat with your family, friends and loved ones. Make sure to visit these places once and have a happy time eating.